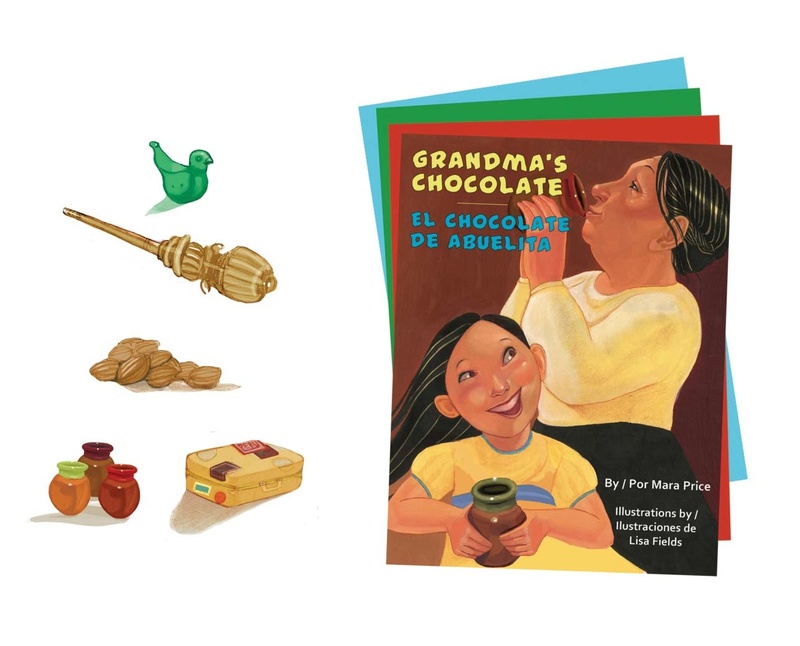 I'm pleased to host day 2 of the blog tour for Grandma's Chocolate, a new bilingual picture book by Mara Price, illustrated by Lisa Fields (Pinata Books). Grandma's Chocolate is about a little girl whose grandmother visits from Mexico with a suitcase full of presents. One of the presents is Mexican chocolate. Now that the weather is getting chilly, I thought it would be good timing to feature a traditional recipe for Mexican hot chocolate. Author Mara Price has shared a recipe - along with some background on the role of chocolate in the history of Mexico. Thank you Mara, and congratulations on your new book! Leave a comment and you could win a copy of, Grandma's Chocolate. To learn more, visit the other blogs on the tour - the schedule is below. Chocolate, or cacao, was first enjoyed by the nobles, warriors and priests of the Olmec, Mayan and Aztec civilizations that inhabited central Mexico and northern Central America at least 2000 years before the Spanish arrived. Cacao is from the Olmec word for chocolate, kakawa. Mentioned in the sacred book of the Maya, the Popol Vuh and Chilam Balam, the Maya considered chocolate so important, they buried their nobles with jars containing the precious drink. When the Aztec emperor Moctezuma invited Hernán Cortez and his officers to a grand banquet to sample the best Aztec cuisine, chocolate drinks were on the menu. The Kekchi Maya from Guatemala were the first to take cacao to Europe. Traveling with Dominican friars, they carried all the utensils needed to prepare chocolate drinks for King Felipe II of Spain. The Spanish guarded the secret of chocolate for 100 years. In ancient times, chocolate was prepared as a hot or cold drink. Among the ingredients reported to have been used were honey, chile, cornmeal, vanilla, allspice, achiote and a kind of black pepper. Bishop de Landa, a Spanish priest who wrote about the Maya, said, "They make of maize and cacao a kind of foaming drink which is very savory, and with which they celebrate their feast." 1. Break the chocolate tablet into chunks. 4. When the chocolate has melted, use a molinillo (a wooden mixer) to make a layer of froth on top. If you don't have a molinillo, use a blender. If you have confidence in your aim, try creating the foam on top by pouring the hot liquid from one container to the other. Enjoy! And warm up with a mug of foamy cocoa! As a kid on a cold morning, I used to dunk French bread in a clay mug of Mexican Chocolate. Now it's time to eat my sacred Snickers. What a wonderful story and history account. Thanks for the hot chocolate recipe. Sounds yummy Mara, I will try this out with my family soon. Good luck with the book. Can't wait to read "Grandma's Chocolate." Great info about the history of chocolate. I knew about the Aztecs but not the rest. Chile in the recipe... hmmm. We love Abuelita chocolate! Thanks for the review and the recipe. Wow! Beautiful story. You need to read this book. Oh, yes. I read it and I enjoyed that meeting with her Grandma. I love your book, Mara, and I can't wait to try out the recipe! A tasty book, Mara! Best of luck! Mmmm, I love hot chocolate, especially with the pan dulce. And on a cold, rainy day like this, I could use some. I'd like to check out this story. Thank you Megan for taking part on the second day of the virtual blog tour. It has been fun and I learned a lot. And thank all for your lovely comments. I hope you try the chocolate recipe. Have fun experimenting with the other ingredients. Thank you all for commenting on the blog tour for Grandma's Chocolate. And - we have a raffle winner. A copy of the book will be sent to Kathy as soon as I receive her address. On Beyond Words and Pictures. This means that it is just like that you are in the actual scene while the books are read to you. Why? Because it is well written from the start until the end. Don't save for your children. Buy books now. Grandma's Chocolate, O sure this one may be an another chocolate for my kid. I am trying make books just like chocolate. While they like chocolate must like books.